Gorgeous lakes and wetlands, warm African sun, impressive historical sites, a rich heritage, and the charming grace of the people, Ghana offers paradise on earth. Ghana is probably the most peaceful, democratic, and corruption-free country in Africa. It is inhabited by over 60 ethnic groups co-existing with one another, free from racial and religious riots unlike its neighbors within the region. Due to the political stability and the recently-developed oil offshore, Ghana is steadily progressing economically. The lives of its people are also expected to improve tremendously. At the moment though, poverty still lingers strong in Ghana, and many citizens are still poor and illiterate and leading difficult lives. New Hope works with many local organizations that aim to empower the poor and bring about development. For an unforgettable experience in Ghana, get in touch with us! Enrich the lives of Ghanaian, and bask in the exotic and amazing nature of the country! By doing a quick internet search, you will find that many international volunteer abroad companies are charging as high as $2,500 for just a two-week volunteer program. The unfortunate truth is that most of these companies keep a large portion of your program fees as profit, and very little money ends up at the destination. However, with our low volunteer abroad program fees, not only will you be able to save thousands of dollars, your money will go where it is most needed, that is, for you, to your host families, and your projects. With the exception of our registration fee of $279, which we require for advertising, and to cover daily office expenses and staff salaries, we guarantee that your program fees go directly to the projects and host families. Here you’ll find the world’s most affordable weekly program fees. New Hope Volunteers will arrange for the accommodation and meals throughout the volunteering duration in the Ghana program. Volunteers will be staying with a host family during the program. If you are undertaking projects in Accra, you may stay at home base instead. You might be sharing a room with other volunteers, a fantastic opportunity to swap stories and experiences. Our host families have all been carefully screened before being selected to participate in New Hope's volunteer programs. 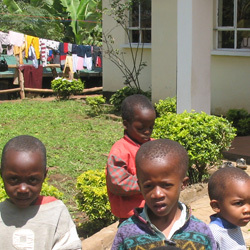 Our host families also have significant experience in accommodating international volunteers. Your hosts will provide you with a warm, comfortable and secure place to stay, while giving you the wonderful opportunity to learn about Ghanaian culture. At least one member of the family will be able to communicate with you in English. Your host families will also provide you with 3 local meals, all of which will be clean and hygienic. New Hope also offers extensive support for you so that you feel right at home while volunteering. The main person supporting you throughout your program will be our country coordinator in Ghana, who is also in-charge of your volunteer program. Whenever possible, the coordinator will call or visit you to see if you are happy and satisfied with your project. You will also have the coordinator's mobile phone number that you may call any time should an issue arise. Our project staff will also guide and help you throughout the program. You will meet the project staff daily during your volunteer work in Ghana. Why should I choose Ghana? What is the language spoken in Ghana? What should I bring for kids in project? Will there be any other volunteers present during orientation time? Will there be other volunteers at my placement? What is the daily routine of the project? Will I have time to explore Accra and Kumasi during my stay? Can I work with other volunteers? Are New Hope Volunteer programs only for international volunteers?